A captain can’t fly a ship if he doesn’t know he’s on the right path. 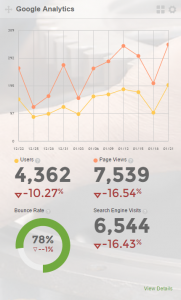 That’s why SkyStats gives you a Google Analytics overview dashboard of unique visitors, page views, and more so you can adjust your site on the fly! 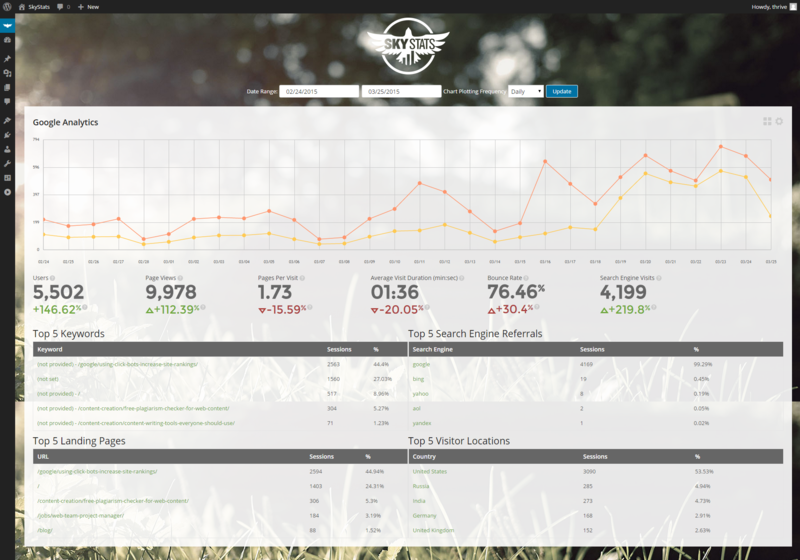 SkyStats makes your WordPress dashboard Google Analytics interactive. Now you can see key statistics to gain valuable insight into how well your site content is performing. This revolutionizing plugin gives you deep insight into your WordPress site’s average visit duration and search engine visits and more. Study Google Analytics’ top keywords and search engine referrals that bring visitors to your site so you know exactly what brings you more customers. You can even track unique users or pages by a specific date range right from your WordPress dashboard! Google Analytics is one of the many services that integrate with the SkyStats dashboard plugin. SkyStats is officially recognized in the Google Analytics Technology Partners directory as an innovative application that helps extends the use of Google Analytics. Please Note: The SkyStats plugin does not provide the capability to install the Google Analytics tracking code onto your WordPress website. We recommend that you use a plugin like Google Analytics for WordPress. Data Usage Policy: Authenticating the SkyStats WordPress Dashboard Plugin grants the widget access to your individual Google Analytics data. Once installed, your SkyStats’ Google Analytics data will never be shared with any third party unless you grant access from the in-page widget. Also, SkyStats authenticates using Auth 2.0 method and saves the Access Token in the database to fetch the user’s Statistics. The file system that runs on your WordPress installation may cache some data locally. You may disable or purge all authentication and cache data from the plugin using the “Deauthorize” button at any time.